When you were a kid, did you dream of an ideal life for yourself in the future? I guess I did, but most of the time only very vaguely. I must have known instinctively that keeping such visions foggy and only partially imagined helps numb the pain when they fail to materialize. I can think of a couple exceptions to this general rule, both having to do with my team, the Red Sox. One dream was actually more of a vow, which perhaps explains why I made sure to make it come true: I decided that no matter where I was when it happened, I would make it to Boston for the victory parade if the Red Sox ever won it all. It was a good dream for me to have, it turns out, for it allowed me to be anything and anywhere, and in fact even implied that my adult life would be one that included rootlessness and drifting. The other dream was in this regard a polar opposite, as its success rested on a sturdy, rooted adult life: I dreamed that one day I would be a season-ticket holder at Fenway. The dream was born in joy. Do you remember the first time you ever came up the tunnel into the stands at a major league baseball game and caught your first glimpse of the green diamond? I’d guess that most baseball fans hold tight to the magic in that memory. My dream of being a season-ticket holder may not have flickered to life in that moment, but when I learned that such a thing as going to every single home game was possible I’m sure my enjoyment in fantasizing about doing so was based in part on that first dose of glowing green. A life built on top of that joy: how could it fail to be a good life? I only took one philosophy class in college, Philosophy 101, and I remember only three things about it: it was taught by an extremely tall man, it occurred so early in the morning that you could never be entirely sure you weren’t dreaming, and once, either in a dream of the class or in the actual class, the extremely tall man climbed up onto a table and while towering over us and gesticulating frantically with his elongated corduroy-covered limbs called the existence of the table into question. I think Plato came up. Something about an ideal table. I don’t know. Years later, after I’d circled back again to an institution of higher learning to obtain my ticket to guaranteed preposterous riches, a master’s degree in writing, one of my teachers, Francois Camoin, added to my spotty knowledge of Plato by, I think, disparaging the Greek’s take on the world. As I understood it, or quite possibly misunderstood it, Francois did not like the dualistic idea of an ideal version of the world, an idea that makes this world into a faded echo. There’s only this world, so you might as well spend your brief time focusing on its actual concrete details, the nouns and the verbs, the garbage, the stink, the talismans, the doubt. My childhood imagining of an ideal adult existence, being a season-ticket-holder at Fenway, has never even remotely approached coming true. If my 12-year-old self were here to ask me why this is, I’d have some explanations, I guess. First of all, besides a three-month stay as a directionless 17-year-old at my aunt and uncle’s house in Auburndale, I have never lived in the Boston area. And even if I did live in Boston, I have never been able to and almost certainly never will be able to produce the kind of money needed to pay for season tickets. My 12-year-old self would be unnerved by this news, the pain in his eyes gradually turning to panic. I woke up yesterday morning feeling old. After four days off it was back to work with my 40-year-old carcass. I was dragging. I tried to write something before work, an appreciation of a book I just finished, Nick Hornby’s Fever Pitch, about the season-ticket holding author’s lifelong life-defining connection with his favorite team, Arsenal. But I could only go on and on about how I had dreamed of being a season-ticket holder when I was a kid (as Hornby had dreamed when he was a kid) and how it had never come true. I was unable to get past my ritualistic self-flagellation to an appreciation of the book before I had to go to work. I started this morning with a baseball card, a 1976 Will McEnaney. In the lower left of the card is an icon of a pitcher. 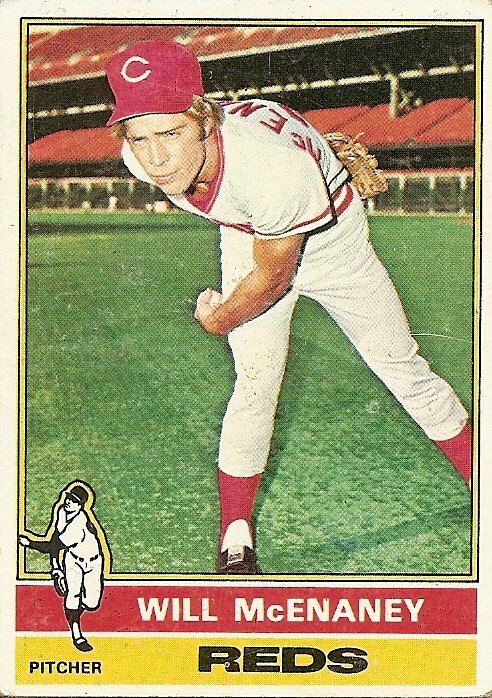 The 1976 cards all had these icons showing an ideal version of the player’s position—left-handed pitcher, right-handed pitcher, catcher, first base, second base, shortstop, third base, outfield. I would venture to guess that few, if any, of the cards from that year featured the real player so closely aping the ideal player as the Will McEnaney card. In fact, Will McEnaney appears to be someone here who knows nothing about pitching (and, judging from his pained, ironic expression, cares even less) and is inexpertly contorting his body into a pantomime of a pitcher by imitating some idealized version of a southpaw. This is no way to go through life, twisted toward some ideal. But if I’m not going to be a fan when I grow up, then who the hell will I be? Kid, you’ll be a fan. Just not quite the kind of fan you thought you might be. In fact, you’ll be very much the kind of fan you are now. Far away from the action. Riddled with distance and solitude and doubt and nauseating boredom and self-absorption. Your fandom will involve the radio and gaps in information and your imagination attempting to fill the gaps. It will involve baseball cards. It will involve holding these cards in your hand and trying to make sense of the actual world. It will at times resemble a quiet strain of mental illness. It will at times resemble prayer. 1. Good stuff, Josh. At one point, I wanted to write a Fever Pitch- inspired book about my Red Sox fandom. A potential excerpt was guest-posted here last year under George Scott. A local banker around here named Bill Ryczek wrote books about sports history at night. I saw a story about him in the Hartford Courant and clipped it (I actually found that yellowed page yesterday when I was looking for something else.) He was an inspiration to me. But then the team won the World Series and everyone and his brother put out a Red Sox book. As an aside, I eventually met Ryczek through SABR and befriended him. We shared a ride with a couple of other guys to a regional SABR meeting Saturday. He’s still writng. He wrote a book about the New York Titans, has some books on 1960’s baseball, and a trilogy on early baseball. Don’t you mean everyone and his mother? 5. Excellent, Josh. I too had childhood aspirations of one day owning season tickets. That has yet to come true, save for a 20-game pack to Qualcomm Stadium to watch the Padres while in college. If I ever won the lottery, I would go to every game — home and away — of the Dodgers for a single season, at least. 6. Thanks for the clarification, Josh–I didn’t want to explain my own punchline. Funny you should say it’s a Hartfordism, though, Ennui, as my mom is from there. 7. I guess that reference went over my head. I know that Josh posted about that book before, but I haven’t had a chance to read it. It does sound like something that someone would buy for me for Christmas. I, myself, once wrote a short mystery, but I’m more of a consumer than a producer. As far as the Red Sox go, I did write a short bio of Jim Willoughby, the god of relief, for a book on the ’75 team. 8 : McEnaney was also on the mound to record the final out (Yaz) of the season before that photo. 10. There’s a more famous photo of McEnaney celebrating the last pitch of a World Series. It’s from one year earlier, in Fenway Park, and was on the cover of SI (it’s also in a frame on the wall of my study at home). 11. A. I’d never seen the ’76 photo before, whereas I’ve seen every moment of the ’75 Series from every angle possible a thousand times. B. If I’m gonna link to a pic of the Big Red Machine beating the Red Sox or Yankees, I’m gonna choose the latter. 12. My childhood ambitions centered around befriending somebody who was actually on the team. You know, becoming pals with Ivan Dejesus or Rick Reuschel, and getting on-field access before games. Man, I was envious of those who got to walk around the batting cage as the jocks lumbered up before the first pitch. When I got older, in my early twenties, my ambitions changed. I wanted to know somebody who could introduce me to Ryne Sandberg’s hot, soon-to-be, ex-wife. There was a time in the early 90s when everybody (Rafael Palmeiro, Davey Martinez, the bat boy, Ronnie Woo-Woo) was dating her. Now that I’m really old (almost as old as Wilker), I’d settle for knowing somebody who has season tickets. I’m not saying I actually want to go to any games, I just want to know somebody with tickets. Any Cubs fans out there? 13. Oh, one more thing. I really like your stuff Josh Wilker. Whatever happened to Boyd and Harris from TGABCFTABGB? Those guys are like the J.D. Salingers of quirky, 1970s, pre-sabermetric baseball books. Since then, baseball writing has mostly become Win Shares, WARP, OBP, BARF, and PUKE. You’re filling the void, providing baseball writing with soul, and I appreciate it. 14. 13 You are spot on. Sometimes you can evoke more baseball without the numbers. Josh- This post brings out the 12-year old aspiring writer in me like Will McNeaney brings out your 12-year old fan in you. And my 12-year-old writer wonders if I’ll ever be able to put words together this well. Thanks for this. Sometimes I forget I feel like I’m reading an infinite book here. 15. *There’s a stray “forget” in that last sentence. My bad. 16. 12 : One of my favorite moments since I’ve moved to Chicago was when I was sitting with a friend at an outdoor table at a coffee shop, and a guy spotted my baseball cap (Red Sox) and gave us his pair of Cubs season’s tickets for that day’s game. It was good to know a season-ticket holder, even for a day. 13 : I don’t know what happened to the great Boyd and Harris. I’ve googled that question before and come up empty, but I’m going to try again. 14 : Thanks, man. I appreciate that. 17. Will McEnaney will forever be linked with Rawly Eastwick in my mind. It turns out that neither of them lived up the the early promise that they showed, and they were both out of baseball much earlier than would have been expected. 18. I just noticed that he appears to be still holding the ball in his hand which lends more credence to Josh’s observation that appears to know nothing about pitching and cares even less. 19. Wait… you mean Will McEnaney isn’t Rawly Eastwick? And does this mean we’re headed back into the Clay Kirby/Clay Carroll/Tom Carroll abyss? 20. it’s always been my dream to own a pair of seats at the garden for everything — sports, concerts, mass unification church weddings, etc. we got partial seasons in 1991 when messier joined the rangers, which included playoff tickets. we upped those to full seasons but dropped them after the second strike because we were so furious. now we share seasons with a group of people, but we won’t necessarily get playoff tickets — or only very few. 21. 20 : I thought about you when I read the part in Fever Pitch, near the end, when Hornby realizes a lifelong dream of moving to a place within walking distance of his team’s games. 22. I think Hornby is a GREAT writer. Fever Pitch was the first one for me, too-bought on a whim, killing time while my much younger son played with Thomas the Tank Engine in the store’s toy section. I loved all his other books, even Slam, too. Rob Neyer’s Feeding the Green Monster, about a year lived near Fenway, is worth your time also. lol – well my third post….but now I remember what drove me to this blog a in May. I was traveling for medical informations training in WI and met this girl as i was walking out the door of my hotel room……..the hotel was filled with people taking similar trainings….i feigned interest in knowing how her class went and went to strait to the exchanging of information phase. Seemed like a good, safe strategy since it could be passed of as networking and job seeking too in case of failure. She gave me her number. But I hate calling and asked for her email……well, yes this all relates….her last name in yhoo address was McCenaney! It triggered in my head that very card above! She was from Col and I said to her, this may sound strange but are you related to will mccenaney? And yes she was! She was Will’s much younger cousin. I left it at that with her and retreated to my room to some research on one of the few Reds from the 70’s that I didnt know. I dont remember having a strat-o-matic card from him (maybe the 77 reds team i had he wasnt on)…expos?? Because I was trying to do research on Will so I could later be more prepared for a potential date with the girl, I stumbled on this site! Give me Rawley Eastwick any day. It’s been a sad summer for me personnaly and I have been in a major funk as I wonder where the last 10 years have gone and watched a good portion of my money that I saved so diligently, vanish in few bad months of stock trading. I am alone in my sadness, not really wanting to hang out with anyone, not even the somewhat hot mccenany chick even if she did ask….alone on a friday, not unlike the times i was alone as a child pouring through my cardboard gods…..using my imagination to make up stories in my head about what I thought about each players card and their life. Not unlike Josh. Had a fleeting thought that if it had worked out with that mccenany chick, i wonder if when we got to that ultimate ‘point’, would his image pop in my head and ruin it. For whatever reason, prior to looking at his card again, the image of the winter warlock from santa clause comes to town pops into my beleagured brain. FYI the cousin was much tanner than pale Will.